One of the sad part of moving back to Haiti is that I can no longer bath in the Guayamouc River in Hinche Haiti simply because it is polluted with trash. The funny thing is... It has always been that way that I just never noticed it before! The first time I went back to Haiti, my first instinct was to take a long bath in "Pas Gason" the area of the river closest to my house, something I missed doing for 17 years. However, I immediately noticed the pile of trash that was there and all the pigs ravaging the pile of trash. Guess what... It has always been the area where people dump trash. As a child I used to go right over the trash and take my morning shower... It was just the normal thing to do. Si se moun Hinche ou ye, ou pral di m-ap pale Hinche mal pa vre? Pa ditou... mwen renmen peyi-m, mwen renmen rivyè-a, men fatra... NOPE! KONFESSION: Fatra-a soti lakay pa-m tou! The honest reason, I think, is because there is NO trash collection in Hinche. I saw a garbage truck parked next to the Mairie de Hinche and I was so excited but since being back I have not seen it collecting any trash in the city neighborhoods. So... 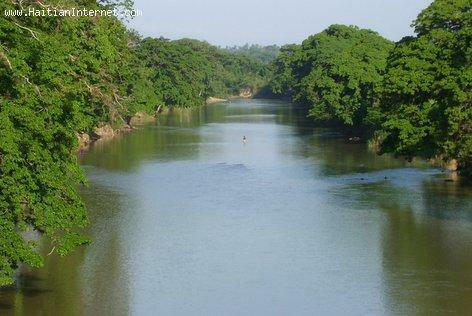 The guayamouc river is, you could say, the trash collector that move trash out of Hinche... Where to? I don't think anybody cares! « How much faith do you have in the Haitian news media? What about contacting a group of motivated citizens of Hinche and create a committee to look for solution to this problem starting by motivating the population of Hinche to change their behavior.